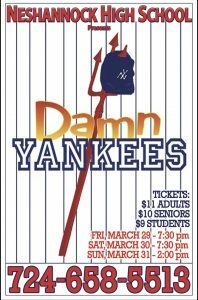 Neshannock High School Presents Damn Yankees! Under the direction of Mr. Michael Cavalier, Neshannock students are preparing to take to the stage for this year’s musical production, Damn Yankees! Be sure to mark your calendars! The musical will be held on March 29, 30, and 31, 2019! This entry was posted in Neshannock Township School District and tagged damn yankees, mancini, mike cavalier, musical, musical tickets. Bookmark the permalink.